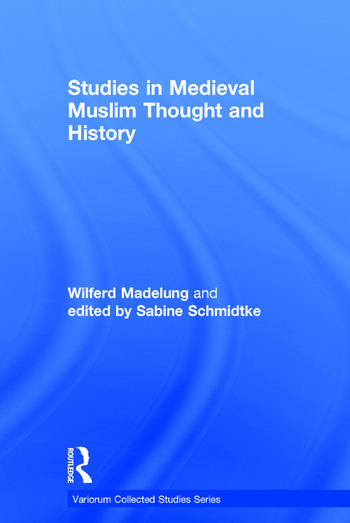 This volume complements the selections of Wilferd Madelung’s articles previously published by Variorum (Religious Schools and Sects in Medieval Islam, Religious and Ethnic Movements in Medieval Islam and Studies in Medieval ShÄ«ism). The first sections contain articles examining intellectual and historical aspects of Mutazilism, the IbÄá¸iyya, á¸¤anafism and MÄturidism, Sufism and Philosophy. The final group of articles focuses on aspects of early Muslim history. A detailed index completes the volume. Contents: Preface; Part I Mu’tazilism: The theology of al-Zamakhshari; The late Mu’tazila and determinism: the philosophers’ trap; Abu l-Husayn al-Basri’s proof for the existence of God; Ibn al-Malahimi’s refutation of the philosophers. Part II Ibadiyya: Abd Allah ibn Ibaá¸ and the origins of the Ibaá¸iyya; Abd Allah ibn Ibaá¸’s 'second letter to Abd al-Malik'. Part III Hanafism and Maturidism: Abu l-Muin al-NasafÄ« and Ashari theology; The westward migration of Hanafi scholars from Central Asia in the 11th to 13th centuries. Part IV Sufism: Yusuf al-HamadanÄ« and the Naqsbandiyya; A treatise on the Imamate dedicated to Sultan Baybars I; To see all things through the sight of God: Naá¹£ir al-Din al-á¹¬usi’s attitude to Sufism. Part V Philosophy: Nasir ad-Din Tusi’s ethics between philosophy, Shi’ism and Sufism; At-Taftazani und die Philosophie. Part VI History: Political horoscopes relating to late 9th-century ’Alids (co-author David Pingree); The vigilante movement of Sahl b. Salama al-Khurasani and the origins of Hanbalism reconsidered; Abu ’Ubayda Ma’mar b. al-Muthanna as a historian; ’Abd Allah ibn al-Zubayr the mulhid; Abu’ l-’Amaytar the Sufiyani; Maslama b. Muharib: Umayyad historian; Was the Caliph al-Ma’mun a grandson of the sectarian leader Ustadhsis? ; Rabia in the Jahiliyya and in early Islam; The four sisters are believers; Sayf b. ’Umar: Akhbari and ideological fiction writer; Indexes. Wilferd Madelung was Laudian Professor of Arabic at the University of Oxford, and is an Emeritus Fellow of St John's College, Oxford, UK. Sabine Schmidtke is Director of the Research Unit on Intellectual History of the Islamicate World and Professor in the Institute of Islamic Studies at the Freie UniversitÃ¤t, Berlin, Germany.